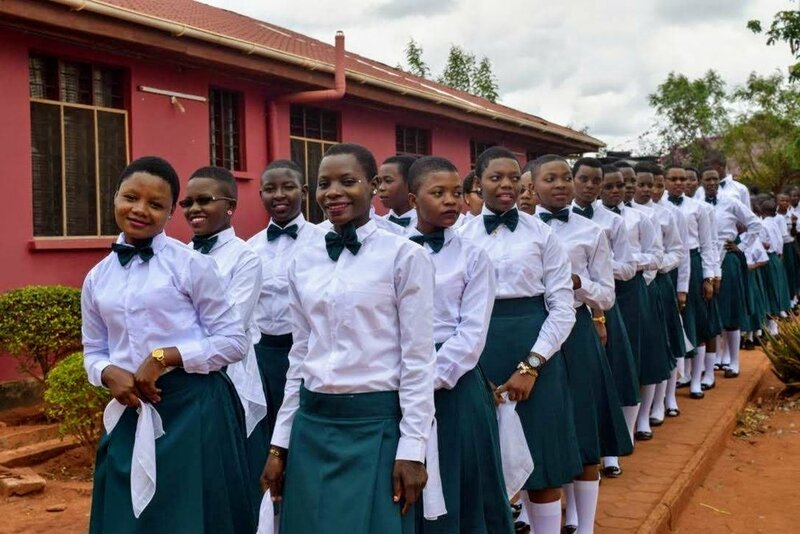 On October 27, 2018, 34 Form 4 students graduated from SEGA having completed their final year of “Ordinary Level” secondary school. Thirty-eight Standard 7 students who finished their last year of primary school and will begin their O-Levels at SEGA next term were also part of this year’s graduating class. We were so excited to award students in both classes certificates of completion for their accomplishments. Every graduating class leaves an impression and has its own qualities that stand out in our memories. This year’s class is particularly active and energetic with some of SEGA’s most accomplished football (soccer) players, actresses, dancers and comedians. Many were acknowledged for their talents inside and outside of the classroom with awards for the best in their respective sports and drama as well as for Best Athlete, Best English Speaker, Best in Hospitality, in addition to awards for individual courses like chemistry and civics. Graduation is always an exciting day and involves a lot of preparation from the school’s administration and the students. The staff formed entertainment, decorating, food, and receptions committees and took on different roles and responsibilities to ensure Graduation Day is fun and runs smoothly. The students are responsible for practicing the performances they’ve prepared for the special day. At SEGA graduation the entire community shows up. Students, staff members, families of all the graduates, organizations that partner with SEGA, and Nurturing Minds supporters! This year, 11 visitors from the US attended the graduation ceremony and will stay at SEGA to lead the English Fluency program. Festivities started Saturday morning and ended after a special lunch. The school staff took visitors on a tour of the campus to show off what the girls learn and do during their time at SEGA. Next the staff, students, and Nurturing Minds Board Members Clarke Blynn and Juma Ally, and Dr. Kiliness Sekwiha, the Guest of Honor, delivered speeches to motivate the students and to praise them for their hard work. (Dr. Sekwiha is a lecturer from the University of Dar es Salaam and the founder of a primary school Queen Elizabeth Academy that partners with SEGA and sponsors four SEGA students.) The Form 4 graduates expressed their gratitude for SEGA and the Chair of the Parents’ Committee thanked the SEGA teachers, administration and Nurturing Minds for making this day a reality: that their daughters have completed their O-levels and will go on to fulfill their dreams. Each class then performed the songs, dances, or skits they’d prepared to celebrate the graduates. The Form 2 students performed a skit with a message reminding Form 4 to avoid engaging in behaviors that would destroy their future dreams during the break between graduation and receiving their exam results. A fashion show followed as well as a beautiful song sung by the graduates themselves. When asked about the day, the SEGA graduates were glowing with pride and happiness. “It was one of my best days at SEGA. The awards encouraged me so much that as a girl I can do more,” said Neema Nickson. The girls love SEGA: their friendships, teachers, and new opportunities. They are elated and we wish the very best and a heartfelt congratulations!